Jonas Mekas has died, aged 96. He was the Louis B. Mayer of the American avant-garde film for more than half a century. A filmmaker in his own right, he co-founded the influential film magazine Film Culture in 1954 and the Anthology Film Archives in 1964, one of the world's largest and most important repositories of avant-garde film. He also helped launch the careers of Jack Smith (Flaming Creatures) and experimental animator Harry Smith (Heaven and Earth Magic). Go ahead, have a glass! STOCKHOLM — The crisis in the Swedish Academy, which started last November with sexual assault allegations against the husband of an Academy member and culminated last Friday in the cancellation of the 2018 Nobel Prize in Literature, has been described in Swedish media as “the cultural conflict of the century.” But some Swedes are concerned that it may be more than that — namely, a national plague of lycanthropy. No one can explain the causality of events, except that the Swedish "werewolf epidemic" began around the time the scandal started rolling in the media. ...William Blake! Forget about L'Inconnue de la Seine, the unidentified woman whose putative death mask was all the rage around 1900. No death mask seems quite as charismatic as Blake's, emanating an uncompromising sternness of character. Except...this is not a death mask! 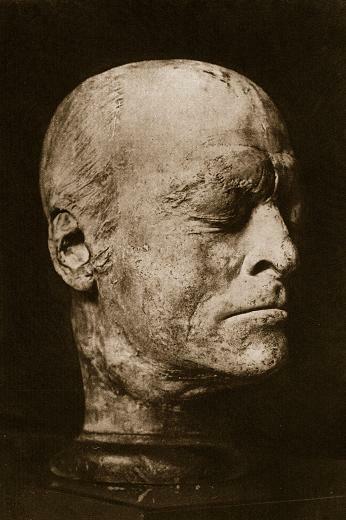 Although commonly known as Blake's death mask, it is actually his life mask; the plaster cast of Blake's head was made by the sculptor James Deville around 1823, four years before Blake's death. It belongs to the National Portrait Gallery in London. Interestingly, Francis Bacon made a series of paintings based on Blake's life mask, the Study for Portrait I-IV (after the Life Mask of William Blake) (1955). Apparently Bacon loved Blake's poems, but hated his paintings, undoubtedly owing to his dislike of "illustrative painting", documented in David Sylvester's book Interviews with Francis Bacon (1975). Strange, considering the somewhat "illustrative" quality of his own paintings. Not Enough Has Been Said or Written About Fernando Arrabal's 1973 Film "Iré como un caballo loco" ("I Will Walk Like a Crazy Horse")! Not enough has been said or written about Fernando Arrabal's 1973 film Iré como un caballo loco (I Will Walk Like a Crazy Horse)!